Thanks, Bruce. This lines up with my notes, too. It's when making larger batches of sausage, in which the cure goes directly into final product, where you can (and should) scale the pink salt back somewhat. 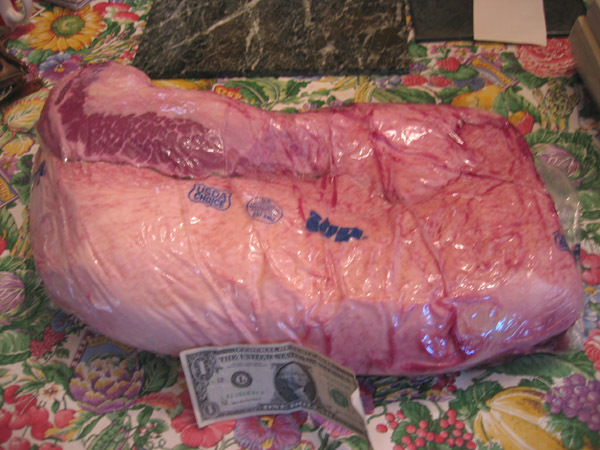 Gary wrote: I recommend setting the raw brisket in from of you (Cathy) point (deckle) to the left, flat to the right. You will notice the point side is higher and, as it moves to the flat, slopes downward. The point contains two sections, flat and a fattier part which together are referred to as the point. These are now sitting in their brine baths in my refrigerator. The flat is destined to be corned beef is in 1-1/2 gallons brine following Charcuterie's recipe. The point is destined for pastrami using 1/3 recipe from extramsg though I used the quantity of pink salt recommended by Charcuterie. Both are now residing in the refrigerator. That is a nice looking brisket Cathy. I wish I would have swapped it out of one the ones that was in my case. The size of this brisket turned into a blessing in disguise. I can now make pretty decent portions of both brisket and corned beef in one swoop. Cathy2 wrote: Both are now residing in the refrigerator. Not anymore, some of each are residing in my stomach. Cathy brought a bit of each to Burt's Wednesday for us to try and, for a first effort, or any effort for that matter, the result was quite good. Thanks Cathy and, remember, I have a vacseal. G Wiv wrote: Thanks Cathy and, remember, I have a vacseal. Thanks for reminding me. The last time I was at the Tuesday Morning in Skokie, they had a wide array of Vacuum Sealing kits for 50% off retail. At the time, I wasn't sure which model to buy. I need to get back there before they are all gone. Inspired by a taste of Extramsg's pastrami the other day, I decided to make pastrami for the first time this week. I made a whirlwind run this morning to Whole Foods (for extra coriander and mustard to add to my pickling spice, per Extramsg's instructions), to Sur La Table (for a meat injector), and then to Excel for a brisket. Back with all of them by 10:45, and I started trimming the brisket and mixing up the brine. I debated how to cut the brisket for pastrami, or whether to cut it at all, and finally ended up cutting about a 3-4-lb. piece of the flat off. What to do with it? I decided I had all the ingredients, so I might as well try my first homemade corned beef, too. So here we are. Top shelf, corned beef bagged and sealed. Lower shelf, pastrami weighed down with a bowl. 5 or 6 days of brining ahead. Now the question is, since the family is not going to be interested in eating this much meat, should I take the corned beef straight from brining to freezing? Surely that's better than cooking and then freezing. 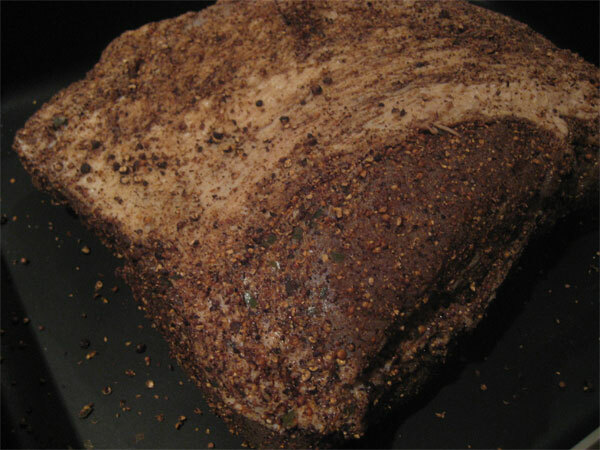 And the pastrami-- we'll never eat all that, so I guess I'll smoke and then freeze some chunks for future use? Seem reasonable? Good luck with it. I say broast the brisket. I don't know if I said before, but for corned beef I double the spices and increase the salt by like 20-30% and the sugar by a bit, too. However, if you steam it instead of boiling it -- or even roast it -- you may not lose too much salt. You can also heavily salt the water first, but still the spicing will probably wash out to some degree. I wouldn't freeze it first. After brining it will be water-logged and all those ice crystals are bound to screw up the texture, I would think. If you were dry curing it, that might be better for freezing. It's $10 worth of meat. Share it and use it as an excuse to make another batch. Mike G wrote: Now the question is, since the family is not going to be interested in eating this much meat, should I take the corned beef straight from brining to freezing? Surely that's better than cooking and then freezing. And the pastrami-- we'll never eat all that, so I guess I'll smoke and then freeze some chunks for future use? Seem reasonable? I'm sorry to hear your family is unable to eat all of the meat you are preparing. Because I'm your friend, I'll volunteer to take some of that nasty unwanted meat off your hands. Me too. I'll even bring me Foodsaver. My wife and I can easily use a whole brisket of corned beef or pastrami. We do freeze it. Yeah, the cost is negligible, but as a cook/parent with a highly variable schedule... it would be really nice to pull open the freezer and remember that there's a corned beef in there waiting to be simmered. Likewise a big hunk of pastrami for sandwiches. 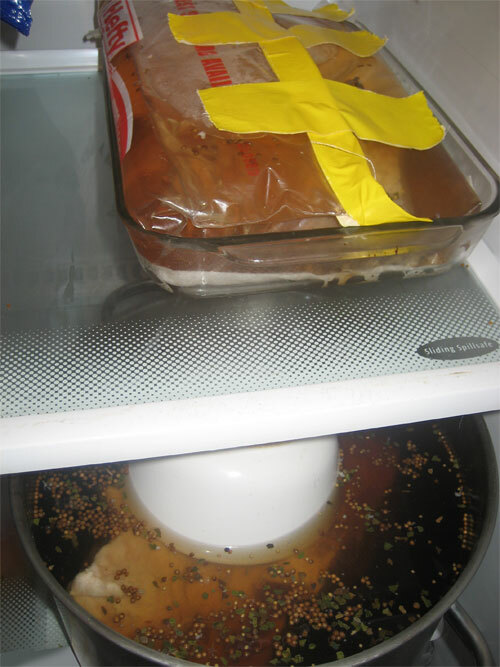 Given the simmering, I figure the fact of having been frozen shouldn't be too noticeable-- I've frozen chunks of an Excel corned beef before without a problem. So, Extramsg, you feel I should double the proportions in Charcuterie? 2 cups of salt to a gallon of water should be 4, and so on? How is your deli doing? extramsg is prob very busy at the moment in the process of soft opening, which I believe is this wk. When I was there a couple wks ago, I can tell you it was coming along very nicely. It's a great corner location with a great feel in a hip hotel located just outside the Pearl district (think River North) next to the nothing short of amazing Powell's city of books. The hotel, the Ace (a boutique hotel from Seattle) already has a very good new restaurant called Clyde Commons besides a Stumptown coffee shop (local roasters) next door as well. In addition, the hotel will be using the deli for it's room service. They've done their homework and I would expect it to be a smash hit home run. Deservedly so. Anyone that's tasted his pastrami will agree. Quite possibly the best I've ever had. Homemade pastrami reuben, with Mike G™ Pastrami, Paulina Market kraut, and Kaufman's rye with seeds. It's good. Not as succulently smoky-salty-beefy as Extramsg's, but mighty nice all the same. So I defrosted my corned beef section from the brisket I made the pastrami from. I didn't notice anything bad from it being frozen-- I think it would be hard to notice that after simmering something for 4 hours no matter what. I salted the water somewhat heavily after ExtraMSG's comment that the Charcuterie brine might not be strong enough for a salty corned beef once you'd boiled it for a few hours. But there was no problem, if anything the potatoes cooked in the same water picked up a little too much salt. Corned beef was very good, if not as complex and interesting as the pastrami. Still, not a bad process, make a big pastrami and a medium-sized corned beef out of the same hunk of meat and have half a dozen meals out of them all. Ronnie_suburban's great photos from the LTHForum 1,000-Recipe Potluck, June 22, 2008, appear here and here and include these shots of pastrami made by Cathy2 using extramsg's brine recipe. Cathy also made a comment about cooking it here. Cathy, I'm curious about the rub you used on the pastrami before smoking it. Question about the smoking of the brisket for pastrami for those who have made it: what type of wood, and how much, did you use? And when adding charcoal, did you also re-stock wood? Thanks . . . I've never done pastrami and I'm excited to give it a try. 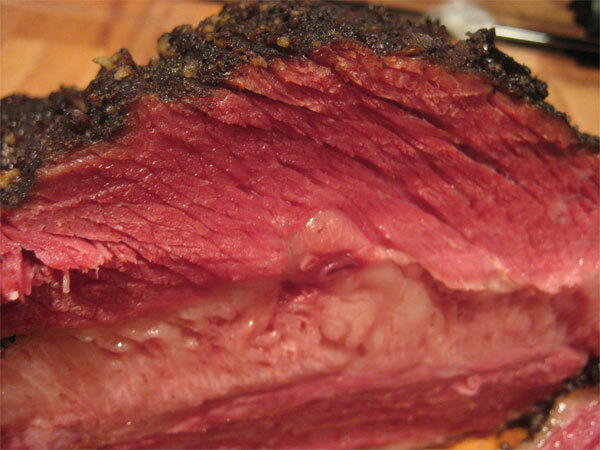 BR wrote: Question about the smoking of the brisket for pastrami for those who have made it: what type of wood, and how much, did you use? And when adding charcoal, did you also re-stock wood? Thanks . . . I've never done pastrami and I'm excited to give it a try. Come on . . . anyone? . . . anyone? Please??? I've heard of using Oak or Pecan . . . I have some Maple. Thoughts? I just use hickory, but if you have it, experiment! I used maple and apple wood. The smoke time isn't all that long, so I only used what I initially put on. Don't forget to simmer/steam it after the smoke. That is what I think makes it really tender. At Kenny & Zuke's, we use oak, following the Central Texas model. I wouldn't bother with something like Alder, which doesn't really have much flavor. And Mesquite is generally too harsh unless you really know what you're doing. So hickory, oak, fruit woods, pecan, etc -- all good. Thanks everyone for the advice. I've got apple, maple and hickory - I think I'll try an apple and maple combo. Now, how much is just right . . . three fist-size chunks for the entire smoke too much? too little? BR wrote: Thanks everyone for the advice. I've got apple, maple and hickory - I think I'll try an apple and maple combo. Now, how much is just right . . . three fist-size chunks for the entire smoke too much? too little? Amounts depend on your setup. extramsg wrote: Amounts depend on your setup. Sorry, missed that. WSM; will smoke it like I would typically smoke a brisket, except I don't want nearly the same amount of smoke flavor (or so I think). Typically when I smoke a brisket, when I add more charcoal after 5 hours or so, I also add more wood. I'm thinking that if I start off with 3-4 fist-size chunks and don't add more wood when I add more charcoal, I should be ok. Thoughts? Personally, I smoke it like I smoke a brisket. YMMV. extramsg wrote: Personally, I smoke it like I smoke a brisket. YMMV. Very interesting indeed . . . well, I'm excited to give it a shot. I never knew I could combine my love of smoking with my love of Jewish deli food (not as big a smoked salmon fan) so I can't wait to get started. Thanks for the tips and I look forward to trying K&Z's when I'm in Portland. 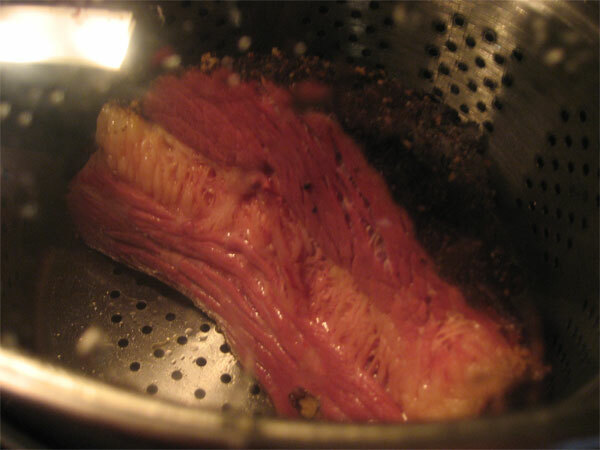 Smoking a soaked an Excel* corned beef for ersatz pastrami. 1-degree when I started, but the smoker did not seem to mind. Soaked the corned beef for 48- hours to leech out some of the salt, mustard slather then gave it a nice spicy rub (coriander seed/black pepper/onion and garlic powder/Mexican peppers/Kosher salt (small amount). I will post pictures as it wends its way to smoky spicy fatty pastrami goodness. Soaked, rubbed smoked corned beef took just under 8-hours to pastrami goodness. Delicious out of hand, even better on corn rye from Kaufman's. 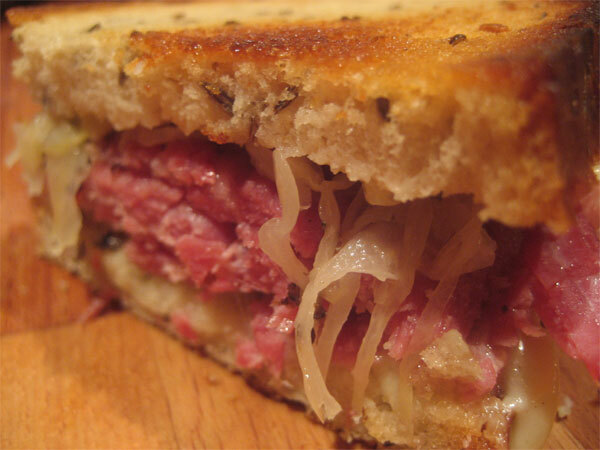 Pastrami ruben for dinner tomorrow.